Random And Some: "Do you realize how insane we've all become?" 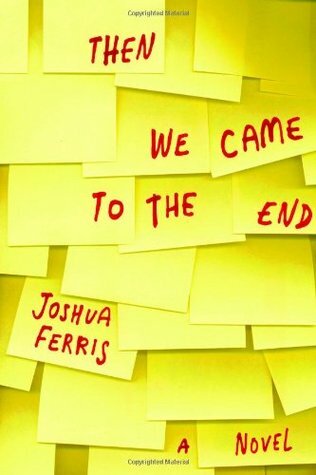 This weekend I finished reading Then We Came To The End (2007) by American author Joshua Ferris, who worked in advertising before obtaining an MFA in writing for UC Irvine. I can't recall exactly how or where I found out about Then We Came To The End, but I do remember falling instantly in love with the plot description, which is why didn't think twice about ordering it. Being a hired gun in a marketing agency myself, I was very curious about Ferris's workplace observations and colorful characters. A stroll around the internet taught me that Then We Came To... is basically the book equivalent to "The Office", which tells you all you need to know. Then We Came To The End takes place in a struggling Chicago ad agency in the 1990s. With the agency failing to win new business, employees are being let go one after the other. Against this back-story, Ferris parades the agency's remaining employees, a hive of conflicting personalities busily gossiping, wasting time and trying to hold on to their precious jobs. As we zoom in on each individual, we learn to sympathize with most of the characters, from the promoted and despised Joe Pope and office entertainer and ergonomic chair enthusiast Chris Yop to boss Lynn Mason, whose breast cancer everyone pretends not to talk about. Come check out their mundance shenanigans. The stories of the above-mentioned characters are really our stories, which is what makes Then We Came To The End such a bittersweet, funny-sad read. Any white-collar salt mine worker will recognize the boredom, redundancies, watercooler moments, timesheet padding, meetings and flirtations and general banality of office life in a heartbeat, making for a highly familiar reading experience. Joshua Ferris does a great job of capturing what working in an office is like, using the first person plural to involve the reader as a participant. His casual writing style is easy to digest and satire done well is always enjoyable, so I suggest you go check this one out if you don't mind a rather pedestrian plot.